…The Aotearoatanga war flag is the war version of the Aotearoatanga flag (especially if adopted as a national flag). …The flag is based on the Aotearoatanga (national) flag. However, its background is deep magenta (a red violet), representing the mix of red and blue: red for Māori people but also for the blood shed by all New Zealanders' in the defense of the country; blue for Pakeha people but also for peace, unity and prosperity brought by them. The obvious change of hue towards a red violet for this version of the flag emphasizes the blood that is going to be shed and the bravery of its warriors and soldiers. The Southern Cross background colour is also changed to blue violet, this representing the peace aimed for and a return to the national sovereignty represented by the Aotearoatanga (national) flag. …This design is warlike in meaning, and, thus, the background magenta is a purple biased towards red, rather than a middle purple. 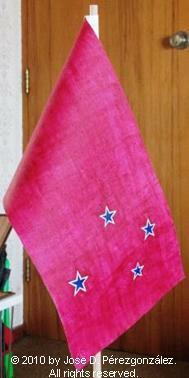 Although the magenta colour does not match the red colour of the starts in the national flag, the basic idea behind the war flag is the inversion of the national colours: the violet background representing peace is displaced by the magenta representing war and suffering, while the red Southern Cross representing culture and growth is displaced by violet, an inherent aspiration for peace and a return to the original Aotearoatanga colours. …Notice that although the Aotearoatanga flag could be adopted as a national flag in a monarchic New Zealand, the actual national flag in pantone blue and with the Union flag in the canton is probably the most appropriate war flag as well as remembrance flag while New Zealand remains a monarchy.